I've kind of been absent from my blog lately, but with very good reason! I'm very excited to be a Grandma for the second time to a beautiful, little baby girl! Isla Quinn was born on August 13, 2012 at 3:31 a.m. She weighed 7 pounds even and was 18 inches long! She is a very good natured baby and so far seems pretty content with life as long as she's fed. I've been spending alot of time cuddling this tiny bundle and making sure that her big brother has lots of attention too. I'm pretty much thinking that you all are going to be seeing her cute face alot! 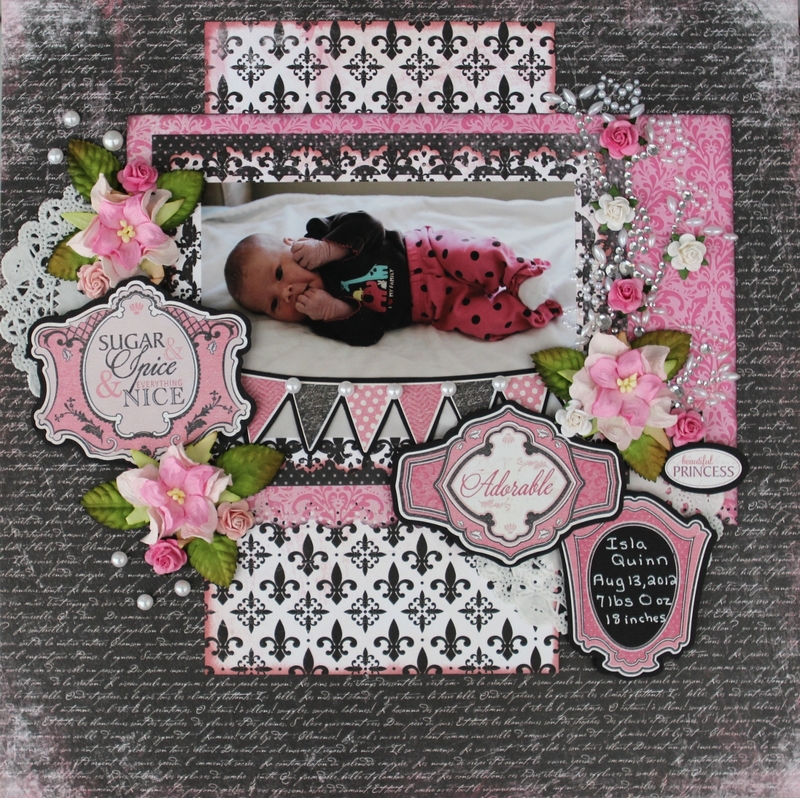 I used some Carta Bella papers for this layout called Paris Girl. Love the quality of their papers and they have such a nice texture. Ohhh this is stunning! See you can do "pretty". Love all the clusters and bling Char! Now you can have a mix of trucks and dolls at your house! Congrats Char and Isla is very beautiful!! Love the colors you used in your layout and that background you created. She's gorgeous (as are your daughters) and I love the priceless layout with the pink and black accents. Congratulations to you all :) She is adorable! And so is your page!! Love how you used these CB papers!! Your scrapbook is really wonderful!! I love the way you organize the memories, remembering that you met in the gallery. congrats!! I love your layout.